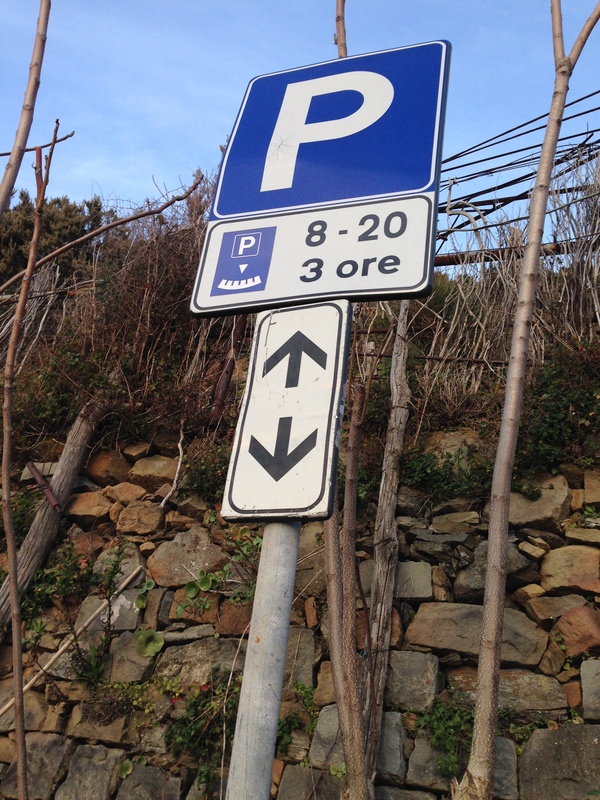 If you are going to drive in Italy, brush up on Italian road signs before getting here. This is not the United States, or Australia, or the UK, or wherever else you might call home. While some signs are universal (like the STOP sign), not all are. Being able to properly read road signs is critical. Have a look at these, or even better, print off a hardcopy and bring it with you so you can brush up as needed. Just because you see other cars doing it, doesn’t really mean it’s okay for you to do it. You might see 20 cars parked near a sign that says parking is prohibited. My advice to you is to not risk it. 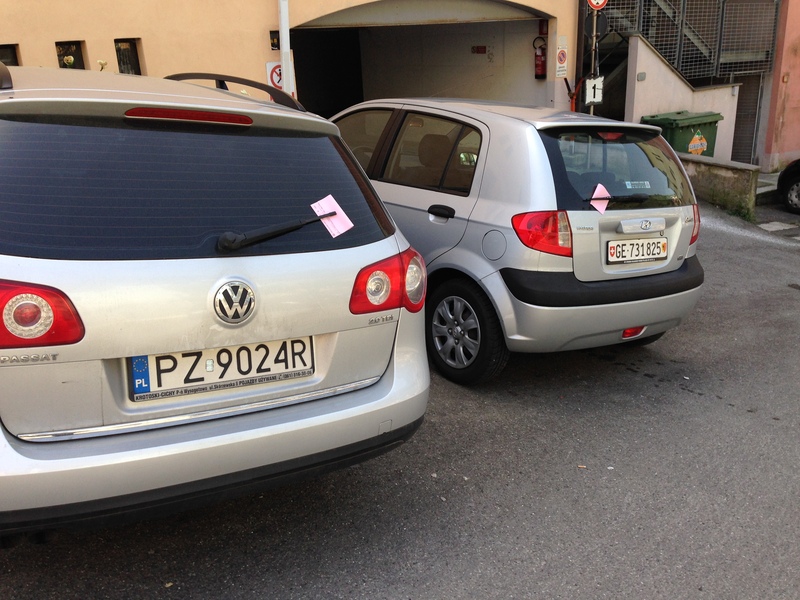 Chances are you’ll come back to find all 20 cars with a telltale pink ticket stuck under their windshield wiper. When in doubt, ask. Yes, it can be a bit trying with language barriers and/or finding someone to ask. But that extra effort to simply double-check could save you a good chunk of money (and a headache to boot!). 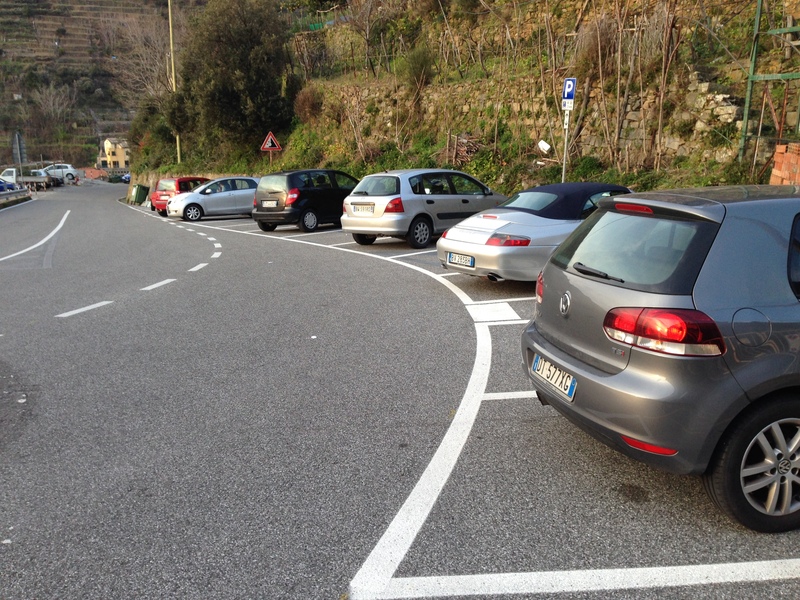 The most common mistake I see here in the Cinque Terre is that visitors park in the resident-only parking (which will nab you a *gasp* €122 parking ticket!). This is further confirmed by ZONA TRAFFICA LIMITATA (more commonly known amongst Italians as ZTL) which means that it’s a traffic zone with restricted access. 0-24 means that the restriction is in effect 24 hours per day. ECCETTO AUTORIZZATI means that the exception is for those that are authorized (in this case, those that have a residents pass that is displayed on the vehicle). Rule of thumb: When you see a gated area, assume that you are not supposed to enter. This is your cue to read the nearby signage. The symbol means pedestrian-only access and that is confirmed by the AREA PEDONALE on the sign. 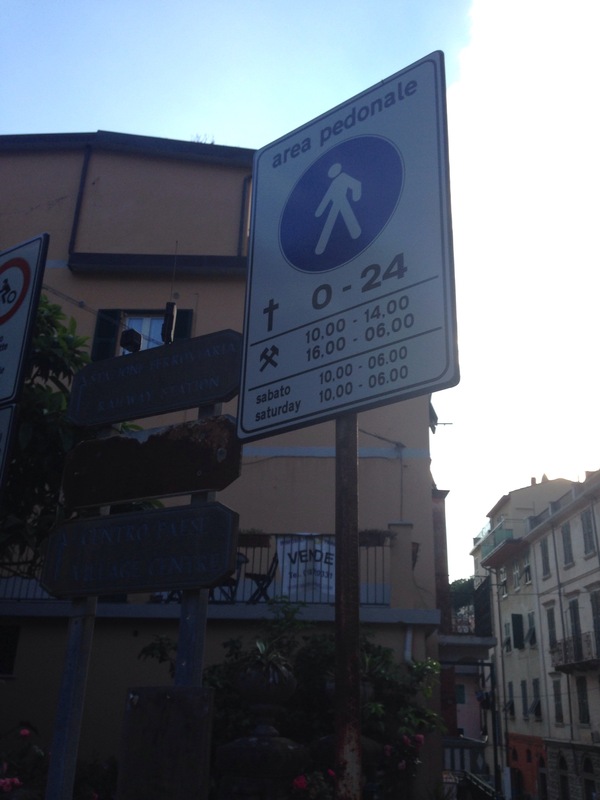 The cross on the sign represents Sundays and holidays and the time range next to it (0-24) refers to the time range that the area is pedestrian-only (in this case, all day on Sunday or the holiday in question). 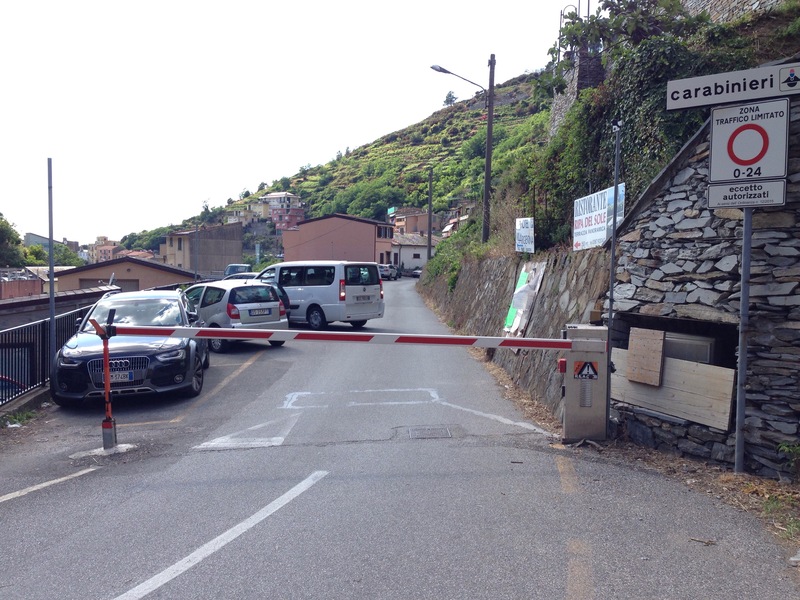 Vehicular access is not permitted on Sundays or holidays. The symbol beneath the cross (two hammers crossed) represents working or weekdays. Monday through Friday the area is pedestrian-only from 10:00 to 14:00 (10am to 2pm) and from 16:00 to 6:00 (4pm to 6am). Using backwards logic (bear with me), this can be interpreted as it is possible there will be vehicular access between 6am and 10am and between 2pm and 4pm. On Saturdays, the area is pedestrian-only between the hours of 10:00 and 6:00 (10am and 6am), so between the hours of 6am and 10am restricted vehicular access is permitted. The large, square blue sign with large white “P” denotes parking spaces. 8-20 indicates a restriction during the hours specified (from 8:00 to 20:00 or from 8am to 8pm). 3 ore = 3 hours, so there is a 3 hour time limit from 8am to 8pm. Using backwards logic this means that there are no restrictions if you park there between 8pm and 8am. The smaller blue square with the “P” and what looks like a bent piano keyboard is a symbol to represent that you must use your disco orario (the little manual spinning clock that will be mounted on your front windshield) to indicate at what time you parked your car there. This is how the local police will guage whether or not you have exceeded the 3 hour limit. In case your car is not equipped with one of these clocks (most rental cars are), the next best thing is to write clearly on a piece of paper the time you parked the car (and display this piece of paper on the dashboard). 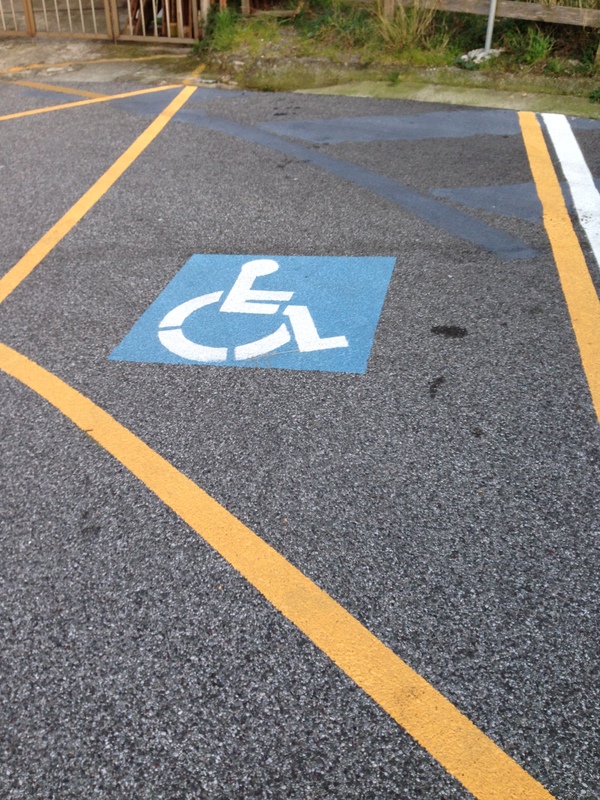 The double arrows indicate that information provided on the sign applies to the spaces on both sides of the sign. 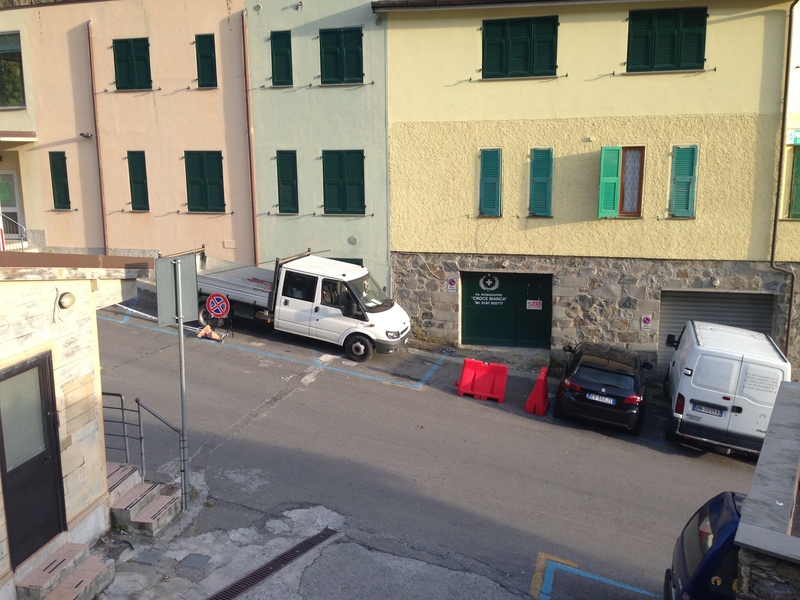 IMPORTANT: Keep in mind the color coding for parking spaces in Italy. DISCLAIMER: The Cinque Terre villages are made up of three different comuni (city halls): the Comune di Riomaggiore (which encompasses Riomaggiore, Manarola, Volastra and Groppo), the Comune di Vernazza (which encompasses Vernazza and Corniglia as well as other neighboring hamlets), and the Comune di Monterosso (which encompasses Monterosso and neighboring hamlets). 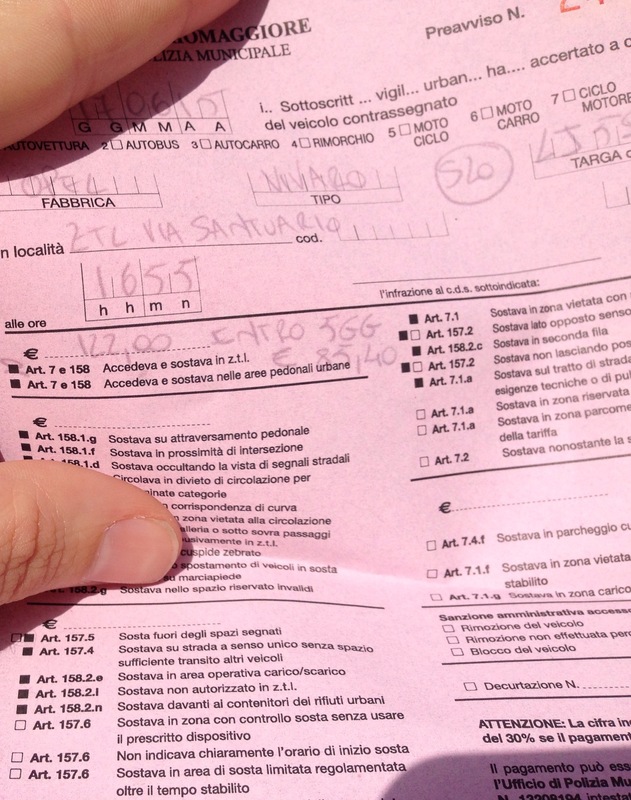 Each comune has different penalties and fines for different parking infractions. 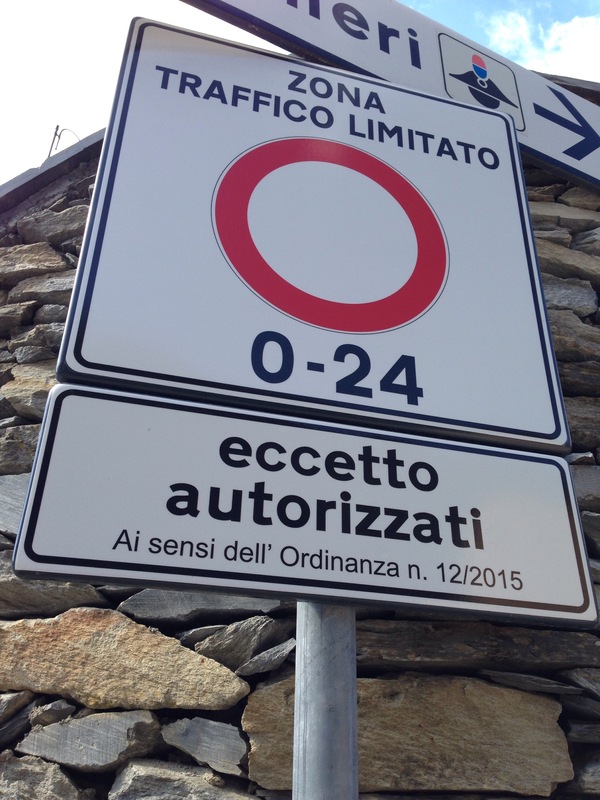 The above ticket of €122 was issued in the Comune di Riomaggiore for parking in the ZTL.